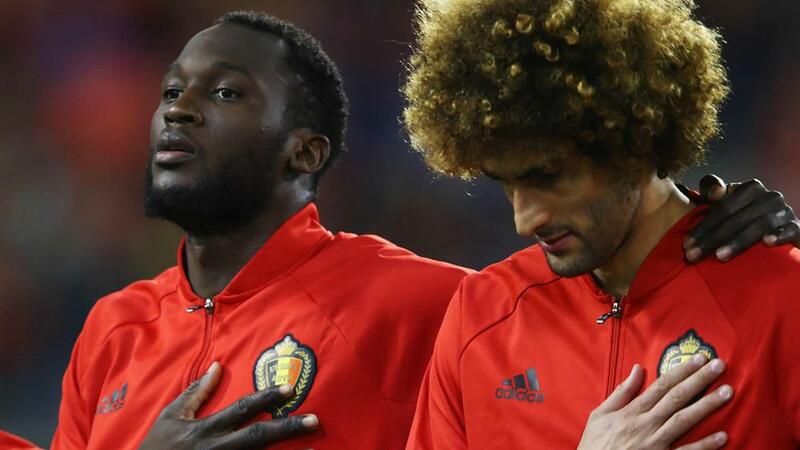 Belgium have included Romelu Lukaku in their Nations League squad, but Marouane Fellaini has missed out through a lack of fitness. Manchester United team-mate Marouane Fellaini will play no part after being overlooked due to a lack of fitness, despite the midfielder featuring in United's win over Juventus on Wednesday. Koen Casteels (Wolfsburg), Thibaut Courtois (Real Madrid), Simon Mignolet (Liverpool), Matz Sels (Strasbourg); Toby Alderweireld (Tottenham), Dedryck Boyata (Celtic), Timothy Castagne (Atalanta), Jason Denayer (Lyon), Christian Kabasele (Watford), Vincent Kompany (Manchester City), Brandon Mechele (Club Brugge), Thomas Meunier (Paris Saint-Germain); Yannick Carrasco (Dalian Yifang), Nacer Chadli (Monaco), Leander Dendoncker (Wolves), Adnan Januzaj (Real Sociedad), Dennis Praet (Sampdoria), Youri Tielemans (Monaco), Hans Vanaken (Club Brugge), Axel Witsel (Borussia Dortmund); Michy Batshuayi (Valencia), Eden Hazard (Chelsea), Thorgan Hazard (Borussia Monchengladbach), Romelu Lukaku (Manchester United), Dries Mertens (Napoli).